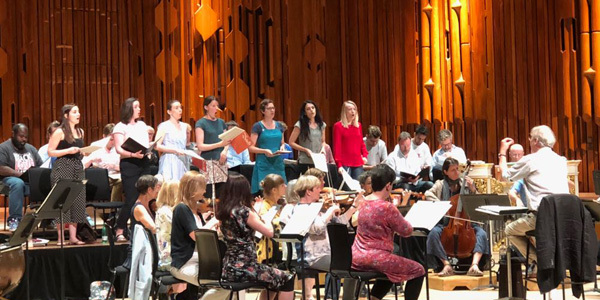 15-17 June 2018 saw a weekend-long celebration of both Bach’s music and Sir John Eliot Gardiner’s 75th birthday at the Barbican Centre. The Monteverdi Choir and English Baroque Soloists performed three concerts from their Bach Cantata Ring tour, which featured at the Bachfest in Leipzig the weekend before, and visited a roster of Europe’s finest concert halls and churches in May. John Eliot Gardiner and his ensembles were joined by Isabelle Faust, Solomon’s Knot, Jean Rondeau and Jean-Guihen Queyras to deliver a varied collection of Bach’s works across seven concerts. The three MCO evening concerts each showcased four of Bach’s sacred cantatas, chosen to correspond with their position in the liturgical year, interspersed with motets by other composers chosen to bring to life the message of each cantata.